The explosive music of THE CHIMPZ is a product of their every day struggles in the streets of LA. Crossing over from rock, hip hop, and heavy metal. With their new release of “Who Can I Trust” recorded and produced by Ryan Greene (Bad Religion, NOFX, Megadeth) Their songs always deliver a great hook and the live show is pure entertainment. 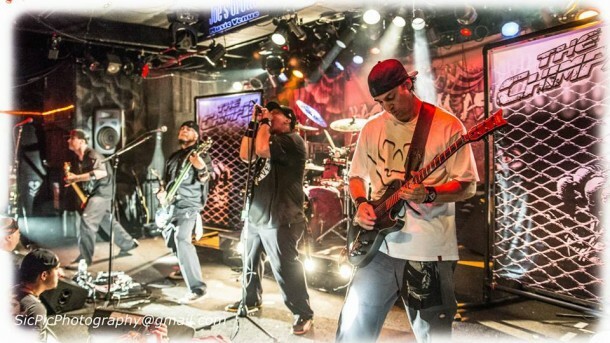 They have been touring consistently the couple years playing shows including Uproar Festival, Seattle Hemp Fest, Orange County Fair, Lane County Fair, Whiskey a Go Go, House of Blues, and other great venues. THE CHIMPZ have been featured twice on FX Channels “Sons of Anarchy”, every episode of MTV’s “Bam Margera’s Unholy Union”, and a number of other TV and DVD placements. Sponsors consist of Jagermeister, Sullen Clothing, Sabian Cymbals, Schecter Guitars, Coffin Case, Equation Audio, Outlaw Threadz, and Audio 2000’s.